Every year for 33 years scientists have monitored the size of the Gulf of Mexico dead zone which forms every spring. Last year’s dead zone was approximately 8,185 square miles, making it the largest the Gulf had seen since mapping began in 1985. This year NOAA scientists are forecasting this summer’s Gulf of Mexico dead zone will be approximately 5,780 square miles, the size of Connecticut. According to NOAA, dead zones are hypoxic (low-oxygen) areas in the world’s oceans and large lakes, caused primarily by nitrogen, phosphorus and other nutrient pollution from human activities such as agriculture and wastewater treatment coupled with other factors that deplete the oxygen required to support most marine life in bottom and near bottom water. The nutrient pollution runs into rivers that eventually empty into the Gulf. The hypoxic zone is caused by excess nutrient pollution, primarily from human activities in the watershed, such as urbanization and agriculture. The excess nutrients stimulate an overgrowth of algae, which then sinks and decomposes in the water. The resulting low oxygen levels near the bottom are insufficient to support most marine life, causing animal life to suffocate and die. There are other impacts associated with high nutrient concentrations within watersheds that studies have found. These include high nitrates in groundwater, higher drinking and wastewater treatment costs and wasted fertilizer applications. The yearly forecasts are based on nitrogen runoff and river discharge data from the U.S. Geological Survey. The forecast assumes typical weather conditions, but the dead zone could be disrupted by hurricanes and tropical storms. The size of the dead zone will be confirmed in early August. While NOAA is predicting an average dead zone this summer, the dead zone remains three times larger than the long-term target set by the Interagency Mississippi River and Gulf of Mexico Hypoxia Task Force, a group charged with reducing the Gulf dead zone. Scientists say that progress has been made in developing additional hypoxia forecast capabilities. 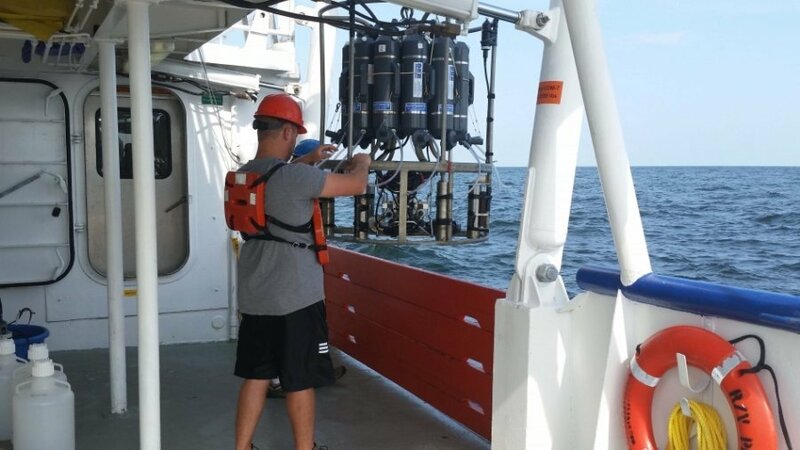 They point to new forecasts that are being used to evaluate the impacts of reducing phosphorus on dead zone size, and to better estimate the timing and location of hypoxia occurrence. NOAA also makes available information to farmers through its Runoff Risk Forecasts, which are aimed at reducing nutrient pollution by giving farmers information about when to apply fertilizers to their fields. Such Forecasts can help farmers ensure that fertilizer stays on fields, instead of washing off into waterways.